We offer solutions for your needs! We operate in the Estonian, Latvian and Lithuanian markets. 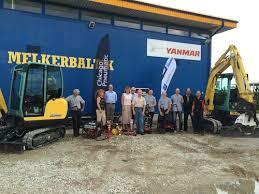 Since 1992, under the name of AS Melker and since 2011 as Melker Baltik OÜ, based on Estonian private capital. For over 25 years, our core business has been sales, rental and repair of: construction machinery and equipment, road construction machinery, drilling and warehouse equipment. Long-term experience and high-level service have enabled us to become a reliable partner for a number of strong companies and institutions.